Yesterday I watched for a few minutes as our science teacher worked with the younger group of our elementary school students. We've started the year with the whole school engaged in the study of ornithology, so in wood shop students have whittled bird wings, and last week we made bird feeders with the 4th grade students. Our school is on a 4 year rotation, studying earth, air, fire and water, as organizational themes, one year at a time, and this is the year of air. The Greek ellements lead you to an understanding of the complexity of life. Is a tree of the earth or of the air or of water? If you put it in the fire does it burn? And yet, the Greek materials scheme lends itself to the notion that each year at school needs not be routine, but can be fresh and alive with new things and as the teachers engage in collaboration. around a central theme. Our students' own museum of eggs and nests. The young ones as shown in the photo were studying bird eggs and painting their own to match those of the wild birds in our area. So each had a small clutch of eggs they had shaped from modeling clay, and were painting them to correspond with those of the bird of their choice. The point of course is not that at some point in later life they will become professional bird egg makers as silly as that might seem, but that they become entangled as observers of the natural world, and begin using their minds in the classification of things. I cannot imagine a parent in the whole world who would not want this kind of schooling for their kids. It is not just my own program that makes Clear Spring School so special. The hands touch all, and we keep getting better at it. Word Origin verb (used with object), academized, academizing. 1. to reduce (a subject) to a rigid set of rules, principles, precepts, etc. as in: "futile attempts to academize the visual arts." NPR ran a series of reports on the fact that major Universities have large research laboratories that are underutilized or idle. There has been a serious shortfall in funding for research. big universities built big labs, hoping for big money, but big results often come from those who are under less ideological and economic constraint. I am also concerned that the academization of science is leading students away from the field, when the need for student interest in science is greatest and the problems the world faces due to global warming, the growth of populations and lack of adequate food and clean water threaten our civilization. Can you imagine students sitting in classes to study physics and chemistry when their hands should be busy making the connections between mind and physical reality that will engage them in a lifetime of investigation? Look no further than the American classroom, whether in pre-school or college to see that scenario come true. While laboratories are underutilized, students are getting more theory and less practice. 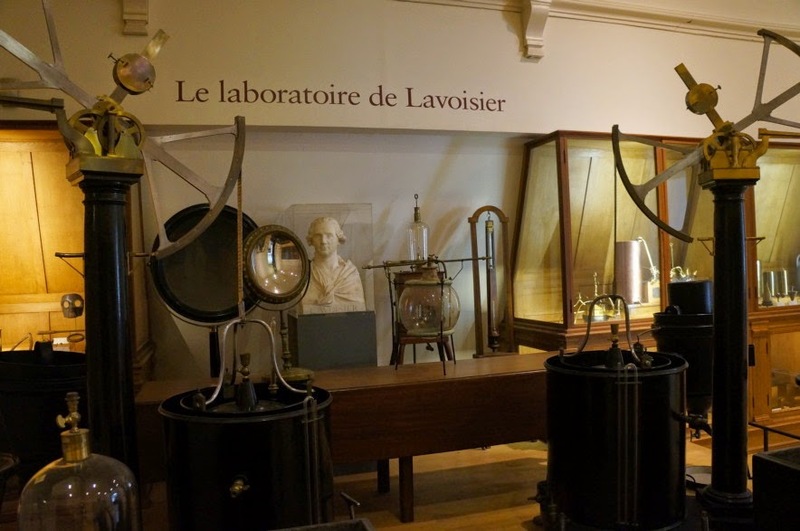 This summer in a Paris museum I visited a display from Lavoisier's original chemistry laboratory. It was a good reminder that work can be done in small spaces by single individuals that can change the world. We have a desperate need to get students entangled in science. And so, how are we to do that? "Theory," says Vives,"is easy and short, but has no result other than the gratification that it affords. Practice on the other hand, is difficult and prolix, but is of immense utility." So why is practice of "immense utility?" Practice is the engagement in process that leads to educational entanglement. When kids these days learn about science in schooling, they are kept at arms length. In contrast,when they do science, hands-on, they become entangled in it and seek the opportunity to do more. It is the same with art, with music, and with the industrial arts. It's why all children need hands-on learning. Academicians take an academic view of education. That's why those who choose to become teachers are forced to spend three years in the study of theory before they stand before a real class of live students and test themselves in their chosen field for the first time. Those with greater experience would have the students practice as they learn theory in almost the same breath. And those who would like to empower science would put tools and instruments in the hands of kids and set them to work and investigation. One of the objects of schooling can be made clear from a study of modern physics. The theory of quantum entanglement suggests that our conception of the essential building blocks of reality is not as simple as the academic and theoretical view would lead us to assume. Electrons are not swirling around protons and neutrons in perfect orbits, but rather exist in wave like forms that contain vibratory information that describes their relationships to external reality. Within the waves are subwaves and micro-subwaves that carry what might be called information or might in some stretch of faith be called consciousness. I will refer my readers to yesterday's post which included a short video on quantum entanglement. If you realize that a guitar string is simply a relationship between patterns of particle like waves under tension drawn between the bridge and tuning pegs, that is able thence when plucked to create patterns of waves that thence vibrate in the air to create sound, take that same situational awareness and apply it to the solar system. You can see how suppositions as outlandish to some scientists as Astrology might actually have real effect, as planets and objects within the solar system form tensions within each molecule and each atom, altering waves within. No single thing in the universe, no matter how small and insignificant is without effect. I am aware that few people read anymore to any great depth, so I am attempting to keep this short and simple. "This blog is dedicated to sharing the concept that our hands are essential to learning-- that we engage the world and its wonders, sensing and creating primarily through the agency of our hands. We abandon our children to education in boredom and intellectual escapism by failing to engage their hands in learning and making." This morning I intend to make boxes. I am cutting slots for barbed hinges and just trying to hinge and assemble enough boxes to ship an order next week, leaving the balance to assemble for orders later in the season. While I am in my shop, and though it might seem so, I do not exist in a form isolated from all else. This weekend, Northwest Arkansas has been overwhelmed by an event called Bikes, Blues and BBQ which brought nearly half a million bikers to buzz through our streets and down through our hollers, where their loud pipes echo and reverberate for miles. Even the sound of a motorcycle can effect every vibratory component of our existence. The bikers were drinking in our pubs late into the night, then managed their retreat into motels and campground to sleep it off. We welcome their money, both in the bars and motels but could do without their noise. In my shop, I am grateful when I turn off the power tools and can work by hand and in near silence. I cannot quite understand why they would choose such loud pipes, except that in their educations, they were not introduced to the full depth of their entanglements. Now, it seems the roar of loud pipes has subsided,to a lower volume, telling me that the half million bikers are making their way safely home. I invite my readers to join the hands-on learning group at Linked-In where a current discussion has been lively. I have been having intense dreams of late, and know that dreams are suggestive of the interrelation of all things. You can wrestle to find deeper meaning, but the most I draw from them is that we are related to each other and to the fabric of life in ways that we cannot fully understand. The dream state may offer an alternate view of what we experience in life, from the vantage point of the unconscious rather than conscious mind. Human thought and perception are "entangled" in the same manner as is the world of quantum mechanics. Just because we are unable consciously to discern relationships, does not mean that the relationships do not exist. 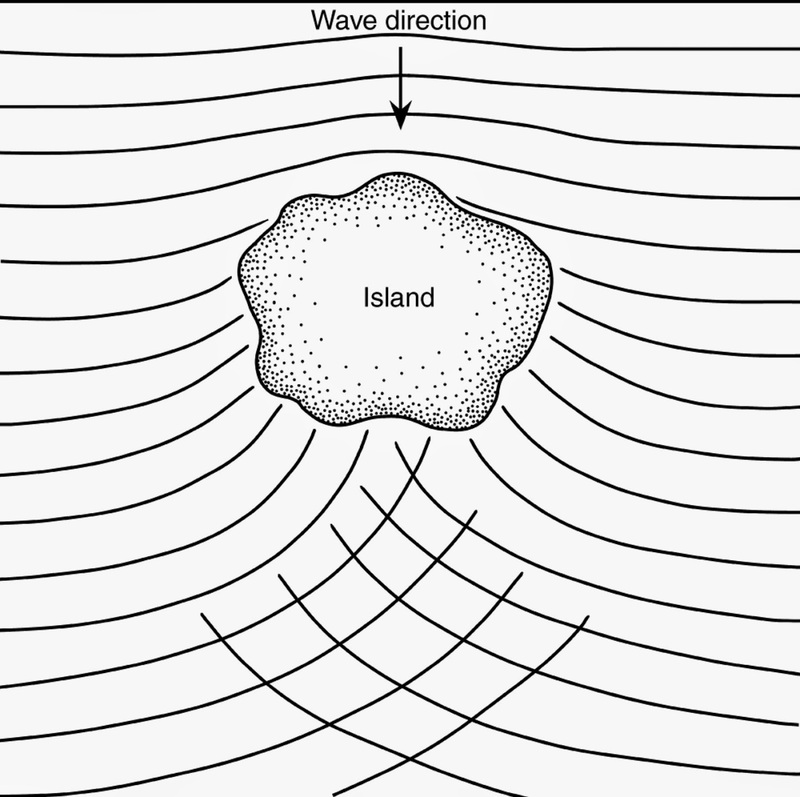 For example Polynesians were able to navigate between islands over great distances by observing wave patterns which were created by waves passing around various islands as shown in the drawing below. The waves formed patterns of interference that described their positions in relation to the islands even though those islands were far out of sight. And yet, non-Polynesians could not believe that they could understand position by simply watching the interactions between the waves that the boat passed through. When you understand that all things exist in two forms, expressing both materiality and relationship, you can begin to understand what Otto Salomon said of the students' work. He said the value of the carpenter's work is in the object made, but the value of the students' work is in the student. The young woman standing at the lathe is not just turning an object, she is turning herself into a craftsman with all the sensitivity to material and form that may entail. I ran across a word this morning, "botcher," which means one that fixes things, whereas the word botched refers to something that has been screwed up in the process of being fixed. A related British term is "bodger," which refers to a woodsman who uses traditional woodworking tools. Two faults, madonna, that drink and good counsel will amend: for give the dry fool drink, then is the fool not dry; bid the dishonest man mend himself: if he mend, he is no longer dishonest; if he cannot, let the botcher mend him. With out doubt, the first time you try to fix something, you may botch the job. Give it a second go, and a third and a fourth and in time, and with care your artistry will emerge. Again, I will be in the shop as much as possible today, making boxes. My thanks to Ed Bronson for this interesting link, Your fingertips perform brain-like calculations. When I was still in college, a friend had noted that MY brains were in my hands, and that launched me on an exploration of the idea. It is my hope that this blog alerts others to the true source of their intelligence. Today I continued making boxes. I've inlaid dozens and am nearing the point of hinging and assembly. Also, we are preparing for the 40th anniversary celebration for Clear Spring School. I spent much of the day yesterday inlaying the lids of small boxes and other products. I have made thousands of small boxes to fill orders over the last 38 years, and will continue to do so. But it is not an intellectually idle exercise. I think about things as my hands are busily engaged in routine productive exercises. I route the channels for the inlays to fit, select and cut the inlay strips to length and trim them to width to fit the channels.The inlay strips are ones I make myself, or are sliced from spalted woods. I spread glue in the channels and with Masonite spacers between, clamp them face to face to distribute clamping pressure. This way, I can glue and clamp 8 or more lids in a single operation. I am convinced that children, despite their engagement in fantasy on occasion, are adept at telling the difference between what is real and what is not, and so it stands to reason that contrived learning experiences might touch them less deeply than incidents in which they learn from being engaged in the real world. "In Schools we create artificial learning environments for our children that they know to be contrived and undeserving of their full attention and engagement… Without the opportunity to learn through the hands, the world remains abstract, and distant, and the passions for learning will not be engaged. --Wisdom of the Hands blog post of October 16, 2006"
This is all quite simple. In about 1983, Howard Gardner, in his book Frames of Mind, put forth the recognition that children that children are smart in a number of ways, and that led to a commensurate awareness that children learn in various ways, too. That led to an assumption that teachers must strive to create lessons in which each intelligence and the learning style of each child would be accommodated. The problem comes when a teacher attempts to plan an organized classroom activity. Few teachers have the capacity, planning to the nth degree, to teach effectively in all learning styles in the same classroom lesson. A second problem, even more basic to teacher effectiveness is that teachers find it difficult to devise lessons outside their own comfort zone in learning styles that they themselves do not share with their students. For instance, most teachers become teachers because they are adept at reading, assimilating the forms of knowledge that are conveyed by reading therefore are most comfortable devising lessons that are dependent upon reading as the predominant learning style. The simple answer to these problems is to take the teacher out of the business of rigidly controlling content and realize that children learn best by doing real things. The wood shop is a perfect example. Every learning style is used and present in the wood shop. Those who are auditory learners find plenty to learn from in the wood shop. So, too, will visual learners find engagement. I can run down Howard Gardner's list and find a place for each child, doing something real and by hand, that engages them in effective learning, without having to adapt the lesson for each child. A multiple intelligences approach is put in place in the teacher's decision that his or her students make or do something of useful beauty, that is relevant to their lives and connects them with their community. I am having one problem in the wood shop. I have a boy who has been diagnosed as having a mild form of autism. He finds it difficult to contend with the noise and activity of the classroom. But in the wood shop, I've given him a log and nails, and by hammering nails and making overriding noises of his own he's found a way to cope. While in most cases, the noisy activity of other students forms a barrier to his participation, hammering nails puts the control into his own hands and the noises arise at his own volition. It creates an ironic situation. Whereas, in most situations, he's the one oppressed by noise, in the wood shop, students have asked whether I can send him outside to work. I will not. And so, I hope the log and nails can become a more meaningful project. My only challenge is to direct it into something less random and more stimulating of growth. And a delightful break through came two weeks ago, when three 5th grade girls asked if they too, might pound a few nails into the log. My overly shy woodworker smiled broadly and said yes. Today, my upper level students will continue learning sketchup. They are excited about it. I am insistent that it not be just about playing with one more fascinating program, and that it lead to the creation of useful beauty. It seems that we are learning a few things about digital technology and one is that it has a way of diminishing the child's capacity to pay attention. And so as children are exposed at earlier and earlier ages to iPhones and iPads and other forms of non-productive technologies, greater diagnosis of ADHD and the prescription and manufacture of pharmaceutical products for controlling children's behavior in school is assured. According to research, published in Pediatrics, "Television and Video Game Exposure and the Development of Attention Problems"
"Results: Exposure to television and video games was associated with greater attention problems. The association of television and video games to attention problems in the middle childhood sample remained significant when earlier attention problems and gender were statistically controlled. The associations of screen media and attention problems were similar across media type (television or video games) and age (middle childhood or late adolescent/early adult)." Yesterday in the school wood shop, I divided my first grade students into two groups to be able to give each student greater individualized attention at the beginning of the school year. One student from each group told me, "I wish we could have wood shop every day." One writer for Time Magazine had tried to convince an expert in child development that he was giving his daughter certain advantages by giving her a laptop at age two. He called the expert Susie Joykiller when she informed him that his daughter could get the same advantages from a pair of scissors. Draw a line and cut to it, and you will have joyfully exercised your powers of attention. That corralling student attention in school has become difficult in American schooling should come as no surprise. It will no doubt get worse as tools of traditional childhood creativity are exchanged for tools that have only digital non-creative capacities. What if kids were to do real things? At the present time, 20% of high school age boys in the US have been assigned the diagnosis ADHD, Attention Deficit Hyperactivity Disorder, according to this article in the New York Times. It is so much easier to prescribe medications, than to direct children into activities that interest them and build their capacities to pay attention. Put a hyperactive kid at a lathe, or allow him or her to build something with hammers and saws, and you will witness the child building his or her own capacity to pay attention. One thing that educational policy makers ought to know is that the skill of paying attention is one that must be learned and practiced. It begins with interest, and grows from application. Any craftsman having cut or sawn to a line scribed on wood, metal or cloth will tell you that their own efforts to pay attention came to greater success through practice. Any one who has played instrumental music will tell you that their attention to the timing and precision of their part, came through practice. Educational policy makers have stripped education of its natural interests, divorced it from the child's most natural inclinations, and thence treated attention as being something that kids either have or not have rather than a skill to be learned. When lacking it they give pills rather than considering that their scheme of learning might be so far off base. It is most surprising that parents buy into that scheme and allow their children to be medicated and controlled in such a manner instead of insisting that schooling be made to utilize the child's natural propensity to learn. Children are hard wired to learn, and our educational institutions have made learning a matter of stupidity. If children were given the opportunity to make useful beauty in schooling, we would find schools to be a thing that interested them and allowed them to sharpen their skills of attention. Today, my first grade students will be carving feathers, my 4th grade students will be making bird feeders and my upper level students will be working with sketchup. There is an epidemic of ADHD (attention deficit hyperactivity disorder) diagnosed among children in school. You can read about it in this article in the Washington Post. Why So Many Kids Can't Sit Still in School Today. The number of children affected by this "disorder" according to statistics published by the center for disease control has grown from 7.8 percent in 2003 to 9.5 percent in 2007 and to 11 percent in 2011. That amounts to a growth rate of 15 percent per year in the number of children diagnosed with ADHD. "Boys ever delight in being occupied in something for the youthful blood does not allow them to be at rest. Now as this is very useful, it ought not to be restrained, but provision made that they may always have something to do. Let them be like ants, continually occupied in doing something, carrying, drawing, construction and transporting, provided always that whatever they do be done prudently. They ought to be assisted by showing them the forms of all things, even of playthings; for they cannot yet be occupied in real work, and we should play with them. "Artisans do not detain their apprentices with theories, but set them to do practical work at an early stage; thus they learn to forge by forging, to carve by carving, to paint by painting, and to dance by dancing. In schools, therefore, let the students learn to write by writing, to talk by talking, to sing by singing, and to reason by reasoning. In this way schools will become workshops humming with work, and students whose efforts prove successful will experience the truth of the proverb; "We give form to ourselves and to our materials at the same time." In other words, having children sit still in school is a shameful waste of their natural inclination to learn by doing. We make schools boring and waste precious time and attention. Yesterday I attended the Ozark Area Community Congress, a meeting of bioregionalists that has been held annually for the last 35 years. The Ozarks is a distinct bioregion, of which my own area of Northwest Arkansas is part. Attending the conference to make a presentation on our AEP/SWEPCO debacle required 6 1/2 hours on the road, driving to and from the meeting. It might have been much less stressful to stay home and make boxes, but I am always grateful to connect with others who have less selfish concerns. Some of the features of the Ozarks bioregion includes similar flora and fauna, forested karst terrain, clear streams (that appear clean and may not be), and poverty. In fact there is an interesting connection between karst topography and poverty. When nationally known geologist Tom Aley, began his lifelong interest in the peculiarities of karst, he looked for a map of the US that would identify areas of karst terrain. He found no such map, but did find a map of poverty, and soon discovered that there is a strong connection between poverty and karst. Maps of karst and maps of poverty are a near perfect overlay. Tom's article The Karst Environment and Rural Poverty will help my readers better understand both. In the meantime, Parade Magazine published a short article on the loss of cursive writing in schools. We've known for some time that cursive is going away as kids poke iPads, iPhones, and other digital devices instead of writing with pencil or pen, and that kids are being left unable to even read handwriting. The article points out that "adults write better and longer prose when they are faster at writing by hand, and we may process what we write by hand more deeply." In conclusion, the article notes that students may be better off with a composition pad than a keyboard. We know that one of the desirable traits of character that should be imparted to children that will be useful to them and society is that they be industrious. Our present course in education tends to make them passive rather than industrious. An industrious child is a self starting child. He or she asks, what can I do next, and receiving no answer, starts learning on his or her own, with an eye toward action. Sitting still in classrooms appears to be the desirable trait of modern education. A friend of mine told of being called to a conference by her son's teacher. She was told that her son in first grade kept falling from his chair and that she wanted to investigate to see if medication would be required to keep him in it. Can you see the horrors of what we have done? Industriousness, in its beginnings is anathematic to sitting under constraint of the teacher's commands, and it's fiercest enemy is the administration of drugs to maintain discipline and restrain the child's natural inclination toward activity. This morning I am going to the 35th annual Ozark Area Community Congress as a guest speaker to talk about the SWEPCO extra high voltage power line that threatens our area. This morning I am doing work in which my own efforts could be replaced by that of a machine. I am making small parts from walnut and linden that will become boxes after they are all properly fitted and prepared. But as the choice is mine, I have chosen to continue making my small boxes just as I have for over 30 years. I could spend weeks making a dedicated machine of some sort, shaving minutes from the time and effort that it takes to make a box, and if I were a machinist whose sole pleasure came from making machines to do what skilled hands on their own might do and thence claim satisfaction from, I would be plotting my own liberation from effort. But I am a craftsman, after all, not a machinist. Last night I participated in a woodworking chat with the North Carolina Woodworkers. It was easy and awkward. I found it difficult to imagine what it would be like on the other end of things, waiting patiently for me to arrange my thoughts and present them over the keyboard. I had done a cheat sheet of posed questions and answers that was to help me keep up the pace, but I learned that the cut and paste function, moving from a word document to the chat forum did not work. So that left me on my own to punch in responses from the keyboard. Much of the interest involved my woodworking program at Clear Spring School and how we might extend our interest in wood working to subsequent generations. Q. What do you see in the future as potentially having an impact on the craft? A. I am concerned that the digital age has some negative impact in the short term. Kids are engaged in investing their energies in digital devices at such an early age, doing things that have been made easy for them by the intelligence invested in chips and software. As human beings, we have always discovered our senses of self by doing difficult and challenging things. We are hardwired for discovery, and expenditure of effort. We feel better when we have worked ourselves full out towards some noble goal. We feel pride when we can demonstrate craftsmanship and at some point, perhaps we will make a distinction between demonstrations of artificial prowess in which we demonstrate the power of our machines, and that prowess that comes through concerted effort and practice. One thing you will notice about the world of digital devices and software development is that every new development is to make things easier and more powerful, so that everyone (with the device) can do whatever it is with as little effort, as little skill and as little practice as possible. If people don’t rediscover their hands (and feet), human culture will be made worse by it. On the other hand, if we find a balance with our digital devices and override the inclination to allow our senses and creativity to be stolen from us, the hands will always offer the potential of doing incredible, mind boggling things. You can’t simply erase the 10 million years of human development in which the hands played such a major part, in one digital age. Today in the wood shop at Clear Spring School my students from 5th grade and up began working on sketchup. My object is to get them designing. The program itself is fun and engaging. But when they have to work a bit harder at their play, I'll know that they are learning. Meanwhile in the science lab across the hall, we had a visit from the chicken lady, Alice McKee. Hands-on learning with real chickens is so much more fun than learing from books. The student of political economy sees clearly enough the need of greater thrift and frugality in the nation; but where and when do we propose to develop these virtues? Precious little time is given to them in most schools, for their cultivation does not yet seem to be insisted upon as an integral part of the scheme. Here and there an inspired human being seizes on the thought that the child should really be taught how to live at some time between the ages of six and sixteen, or he may not learn so easily afterwards. Accordingly, the pupils under the guidance of that particular person catch a glimpse of eternal verities between the printed lines of their geographies and grammars. The kindergarten makes the growth of every-day virtues so simple, so gradual, even so easy, that you are almost beguiled into thinking them commonplace. They seem to come in, just by-the-way, as it were, so that at the end of the day you have seen thought and word and deed so sweetly mingled that you marvel at the "universal dovetailedness of things," as Dickens puts it. "The unities, sir,' he said, "are a completeness—a kind of universal dovetailedness with regard to place and time—a sort of general oneness, if I may be allowed to use so strong an expression. I take those to be the dramatic unities, so far as I have been enabled to bestow attention upon them, and I have read much upon the subject, and thought much." Charles Dickens (1812-1870), British novelist. Mr. Curdle in Nicholas Nickleby, ch. 24, pp. 311-312 (1839). Today in my wood shop, I am making boxes. At school, I am making racks for lathe tools in my quest to organize the new shop space. I have been loading Sketchup Make 2014 to the school's laptops, and plan to have the students in middle and high school at work with sketchup for the first time this afternoon. This morning my first through 4th grade students will attempt to carve wooden feathers. Almost the whole school from 1st through 9th grades are engaged in the study of Ornithology, as part of our 4 year rotation, Earth, Air, Fire, and Water, symbolizing the 4 Greek elements. We are in the air year of rotation. We know of course that all things are interconnected, and that the divisions between such things are tenuous at best. But the important thing is to know that not only can things be taken apart into basic components, they can reassembled into a discovery of the fabric of real life. We are concerned with the whole child. To Froebel, life, action, and knowledge were the three notes of one harmonious chord; but he did not advocate manual training merely that children might be kept busy, nor even that technical skill might be acquired. The piece of finished kindergarten work is only a symbol of something more valuable which the child has acquired in doing it. It is always the creative instinct that is to be reached and vivified; everything else is secondary. By reproduction from memory of a dictated form, by taking from or adding to it, by changing its center, corners, or sides—by a dozen ingenious preliminary steps—the child's inventive faculty is developed; and he soon reaches a point in drawing, building, modelling, or what not, where his greatest delight is to put his individual ideas into visible shape. Instead of twenty hackneyed and slavish copies of one pattern, we have twenty free, individual productions, each the expression of the child's inmost personal thought. This invests labor with a beauty and power, and confers upon it a dignity to be gained in no other way. It makes every task, however lowly, a joy, because all the higher faculties are brought into action. Much so-called "busy work," where pupils of the "A class" are allowed to stick a thousand pegs in a thousand holes while the "B class" is reciting arithmetic, is quite fruitless, because it has so little thought behind it. Last night my wife and I attended the banquet in Little Rock at which the Governor's Awards for Quality were presented to Arkansas corporations. One of the Governor's Award winners is a name that woodworkers will recognize as being the maker of the best electric motors in the US. Baldor. Baldor motors have a reputation for quality and reliability, so it is no surprise that they could earn this prestigious award. Many of their best motors are made in Arkansas. The Arkansas Quality Awards, presented by the Arkansas Institute for Performance Excellence has grown into a pretty big deal since I was first involved in designing the award base 20 years ago. I was pleased to see photos and short videos showing corporate CEOs in their offices with their quality awards proudly displayed, and last night 3 companies received the top award. I felt awkward in such a large crowd, but it was nice to look up at the stage and see three award bases I had made lined up in a row to be presented by Arkansas Governor Beebe. We also went to the Clinton Museum Store, and I was reminded of when then Governor Bill Clinton bought some of my inlaid boxes to carry as gifts of state on a trade mission to Asia. It seemed to me that selling those boxes through the museum store would be an obvious hit. One of the best business decisions I made as a craftsman was that of working with woods from my home state, and emphasizing their beauty and value. Ironically, the small inlaid boxes and my making the Arkansas Governor's Award for Quality are connected. Twenty years ago, I got a call from Barbara Harvel, then director of the Arkansas Quality Awards program just starting in Arkansas. She told me that my name had been given her as a possible designer of the Award base. She wanted to see a sample of my work, I told her that I had made small boxes for Governor Clinton that were for sale in Little Rock. She looked down on her desk, and said, "Oh, like this?" She turned over the Doug Stowe box on her desk that had been given to her by her husband Paul and discovered my signature underneath. That coincidence clinched the deal. I know this blog post has all been rather chatty. My point is simple. We tend to take things apart in our minds, noting the differences between two things. The truth is far less complex. You can enter to win a copy of my new book on the Fine Woodworking website. Today my wife and I go to Little Rock for the Arkansas Quality Awards banquet, in which the Governor's Quality Awards will be presented. This is the 20th year of Arkansas Quality Awards. I was designer of the award base, and each year make one or two as required. In celebration of the 20th year, my wife and I were invited to attend. This article from Columbia University sheds light on the development of the brain in relation to our uncontrolled experiment in digital technologies. The first two years of a child's life are spent growing neurons and connecting dendrites, and from there the pruning of dendrites begins to make the brain more efficient later in life. You may have noticed that some things are easier for young people to learn than for older folks. For instance the introduction of languages is easier for very young children to grasp. According to the article on the Columbia University website, How is digital technology changing the way kids' brains learn? "The average American kid between 8 and 18-years-old spends eight-and-a-half hours a day on a computer, listening to an iPod, watching TV, or paying attention to some form of digital technology. To put that another way, over half of an American child's waking hours are spent plugged-in. To YouTube. To Facebook. To their cell phones, you name it. As they get older, they begin to spend even more time online." If they are online, they are not learning the things that children have always learned in the past, how to observe directly their environment, and to make from it beautiful and useful things. And so our uncontrolled experiment in the relentless distribution of digital technologies involves the pruning of dendrites, the steady decline of human faculties, and offers profound implications for the future of human culture. 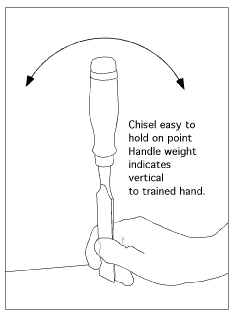 I you want to know more about fixed and stubborn, pick up a chisel, and if you are unused to the muscularity of its use, give it try and see what you can do with it. Most adults in the US have become trained in the disuse of their muscular faculties. Is that what we want to give to our kids? Or shall we offer them the full range of human expression? Making T-squares... "what do I do next?" Last Thursday I guided my students, 5th through 11th grades in making "T" squares, they each came up to me, one at a time, asking "what do I do next?" Making T-squares was their idea and was a way that I hope they can carry some of their interest in mechanical drawing home with them for further exploration. There are three important standards in making a T-square. The blade must be straight. I took care of that standard by carefully jointing each one and ripping it to width on the table saw. I advised the students to avoid sanding the edges so that they would remain crisp and straight. The head of the square must be designed in such a way that there is sufficient space for the blade to be attached. We met this standard by my checking their designs to make certain that they not cut into the space required. The head be attached square to the blade. For this, I had each student attach the head of the square with a single nail and glue, so that it could be clamped in a square position while the glue dried, and that it's squareness could be checked before the glue set. 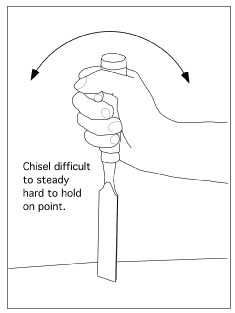 Additional nails can be driven in place after the glue sets, but to put in additional nails while the glue is still wet will likely force the head of the T-square out of square. So to meet this standard, I had to get the students to deliberately restrain themselves, when their natural inclination was to simply drive 4 nails and be done with it. If these three standards are met, the T-square should be useful. If not, not. There are other standards that have to do with the appearance of the T-square that the child can select. The head of the square can be symmetrical on both sides, or can be deliberately asymmetrical. That would be a standard chosen by the child. The arrangement of the nails attaching the blade to the head should be made to appear intentional rather than random. Evenly spaced and symmetrically arranged implies the presence of an attentive and caring human being in the making of it. We call that "craftsmanship." To meet this standard I encourage the students to carefully measure and mark the location of the holes prior to drilling. How smooth should it be? This is a tool. It will be handled, and tools that are sanded smooth to the touch invite more frequent use. One thing I'm wrestling with at school is that my kids are extremely creative to the point that anything goes. They enjoy messing with materials and tools and they are a long way from being able to stand back as a craftsman must and assess their own work from the standpoint of useful beauty. Another challenge I face is that of getting them to look at their surroundings for the answer, "what do I do next?" Kids have been conditioned to have either teachers or the screens of their devices between themselves and reality when they would be bettter served by simply looking directly at reality and attempting to assess its qualities for themselves. A new charter high school in Springdale, Arkansas, called "the School of Innovation," is attempting to escape the notion of graduation being based on "seat time." The idea that students can graduate high school based on spending x number of hours sitting at desks during a set range of courses, is archaic and destructive. I've hardly a clue as to how well the new school will do, and whether or not it will perform well enough to overcome the policy maker's objections to such things. Most schools are based on units of seat time called Carnegie units, rather on the student's actual learning. A Carnegie Unit is supposed to represent 120 hours of instruction, but we all know that instruction is not the same as learning. Time spent bored in classrooms while the professor drones on and on is not learning. The Innovative high school is a step in the right direction and I wish them great success. Sadly, they seem to have no wood shop. They claim to be involved in STEM education but seem to have only digital devices. No saw or hammer in sight. This time of year, I usually receive an order from Appalachian Spring Gallery that sets my box making in motion. It came yesterday. I also have a large corporate gifts order due in late November, so I am getting ready for that, too. I've spent enough time at school relocating my school wood shop that my classes are going OK and my students are having fun and learning. Folks have asked how I find a balance between writing, teaching and woodworking, and it is simply a matter of attending the squeaky wheels. Each part of the triad, writing, teaching and woodworking in my own shop is kept fresh by regular rotation. Keeping these three activities in rotation keeps me productive and prevents boredom from getting in the way of my work. First I compared the new order with what I already had in stock, and noted the kinds and sizes of boxes in the order that I could not ship. Then I set to work on those, making them in multiples, so that I'll have enough to fill the order and replenish my inventory. The first step is to rip walnut and linden (basswood) into widths about 1/4 in. wider than the finished stock. Then I resaw that material into thinner stock that can be planed to final thickness. Then after one edge is jointed straight and smooth, the stock will be cut to finished width before being cut to final length. I keep the prices reasonable on my boxes by working in multiples, as many as 50 or 60 at the same time. If you are not a resident of North Carolina or one of the surrounding states, you will need to be approved for membership. This is a simple process but you must register before the evening of the event in order to give the administration of the site time to approve your membership. I will give the address again next week and again provide the link. One question I've been asked to address is as follows: "What do you see in the future as potentially having an impact on the craft?" I am concerned that the digital age has some negative impact in the short term. Kids are engaged in investing their energies in digital devices at such an early age, doing things that have been made easy for them by the intelligence invested in chips and software. As human beings, we have always discovered our senses of self by doing difficult and challenging things. We are hardwired for discovery, and expenditure of effort. We feel better when we have worked ourselves full out towards some noble goal. We feel pride when we can demonstrate craftsmanship and at some point, perhaps we will make a distinction between demonstrations of artificial prowess in which we demonstrate the power of our machines, and that prowess that comes through concerted effort and practice. One thing you will notice about the world of digital devices and software development is that every new development is to make things easier and more powerful, so that everyone with the right software and the device to run it can do whatever it does with as little effort, as little skill and as little practice as possible. If anyone has doubts as to how people learn best, whether by being told or by being shown, I would be surprised, and yet we still make schooling primarily an act of being told. This article, Signing, Singing, Speaking: How Language Evolved should clarify the issue. I think it unlikely that a single thing... gesture or singing, as a thing in isolation would be the sole foundation for the development of our language capacity. Even the matter of singing, without the rhythm established by the hands, would lack emotional depth, and it is a mistake to take human behavior apart in such an analytical manner, as we then miss the reality present in the whole of us. Another article on NPR, This Is Your Brain. This Is Your Brain On Music makes the point that brain scanning is revealing the benefits of music on the development of language capacity. Educational policy makers would like learning to be simple. Shove it in like it's coal and the kids are bins of varying capacities. But children are multi-dimensional and reliant on a full range of senses that we ignore for the sake of false efficiency. The most recent issue of Wooden Boat Magazine, (Sept/October 2014) has an article about the Thames Waterman's Stroke, a distinctly efficient means of rowing a small craft through water. The article provides the history of it and makes a sincere attempt to teach it. This particular stroke was developed, and passed on, by demonstration generation to generation, through hands-on experience. It was brought to the US where it influenced the stroke used by universities to propel racing sculls. The article in Wooden Boat makes a good read, and the photos would provide an oarsman a foundation for experimentation, but without the experimentation, the process of rowing cannot become experiential. Even with the best of illustrations and sifting though carefully composed text, it cannot be learned without doing. Music and nearly all else are the same. And yet "educational" policy makers are content in American education to leave off the experience needed to actually teach, and for the students to actually learn. My 5th through 11th grade students are all working on drafting and will begin learning sketchup soon. After a brief introduction to mechanical drawing, they want to make their own T-squares. Those we will begin today. I was up early this morning to make a presentation on Save the Ozarks for our local Rotary that meets every Wednesday morning at 7 AM. They asked if I would speak about our on-going efforts to stop the monstrous power line from being built through the Eureka Springs area. This issue is not just that of a small town not wanting to sacrifice its own scenic beauty for the good of the whole, but one of a corporate giant (more of a dinosaur) gobbling up the future of the planet. AEP is the largest corporate producer of greenhouse gasses in the world. With new restrictions on coal, they are shifting their investments to extra high voltage power lines, where state regulators guarantee a 12 to 15% return on investment, whether the power lines are needed or not. The other issue is that they have misrepresented the need for this power line, both to the public service commission and to the people of Arkansas. I've also been moving the last of the cabinetry and drawers into my new school wood shop location. It is a pleasure being right in the middle of things. Witnessing is best if it involves all the senses, not just one. Doing should be responsive to what you or the child have witnessed. When a child can teach what they've learned, that means that they have learned to a greater depth at which they have been reflectively engaged. Today, my first graders were so excited to go to wood shop, and my 4th grade students informed me that woodworking is their favorite class. I hear that kind of thing all the time. My middle school students worked on their mechanical drawing, and I conducted a brief introductory lesson in the use of Sketchup. One of my students claims to know enough already that he could teach sketchup to the class. Knowing that accepting the responsibility to teach is one of the best ways to assure depth of learning, should I take him up on the offer? A Clear Spring School parent sent me this link to the School at Rose Valley, which like Clear Spring School attempts to hold woodworking at the center of school life. "In the dark ages when they wanted to torture a man beyond all possibility of his holding up under it they did not torture him with thumbscrews, or the maiden, or the boot. They put him in a room without interests, where there was nothing to do, nothing to see, and dropped a drop of water with deadly regularity on his head, and he invariably went mad. I accuse the present system of doing precisely that thing. The man who has to stand at the tail... of a machine, doing uninteresting work--monotonous, regular, but without any interest, without any volition--is in exactly the same position as the man with the water dropping on his head... As manual training teachers you should realize that it is not enough to take the children into your school rooms and give them a glimpse of heaven if hell lies just outside of the door. Here is this great school of industrial art which teaches people year in and year out how to design beautifully, how to weave properly, how to dye properly, and then gets them jobs which require them to do the very reverse... the demand is not for the best thing that man does but the worst--for the purely commercial thing. That is not enough. That is why I am making this plea for the arts and crafts; that is the connection that I see between the Arts and Crafts movement and manual training school. The manual training school has done much to make the Arts and Crafts movement possible. I have no statistics for this statement; you do not need statistics for such thing--you simply know them; you cannot go on teaching and training these young people for twenty-five years that is its right to do things that are worth while and not have some of them adopt the teaching." I was struggling this morning to find something to say about the role of crafts in the creation of human culture, and sometimes, the less said the better. Click on the video to see it on youtube in wide screen format. Two terms you will encounter in this that may be unfamiliar. Anandam means euphoria or extreme bliss. Sapience means wisdom. Yesterday I met with members of the Arkansas Arts Council, and a small committee from around the state to select recipients for the Arkansas Governor's Awards in the arts. Awards are given in a variety of areas, including corporate support, a patron's award, a lifetime achievement award, an award of recognition for the work of an individual artist, an award for arts education, etc... seven distinct awards in all. All the various arts need to be considered, dance, visual arts, music, drama, writing, story telling and more. I was surprised that there were no nominations from the Eureka Springs area... which simply states that we tend to think of our small town as existing on its own, and not so much interconnected with the statewide arts efforts. That is a thing we must fix, and so to remedy things, I plan that next year we mobilize to make more nominations. The Governor's Awards in the Arts which we selected in yesterday's meeting will be made public knowledge later in the month, and the awards will be presented in the spring of 2015. Today, I plan to clean shop. It is a mess. And it will help me to prepare for my next work to get it better organized. 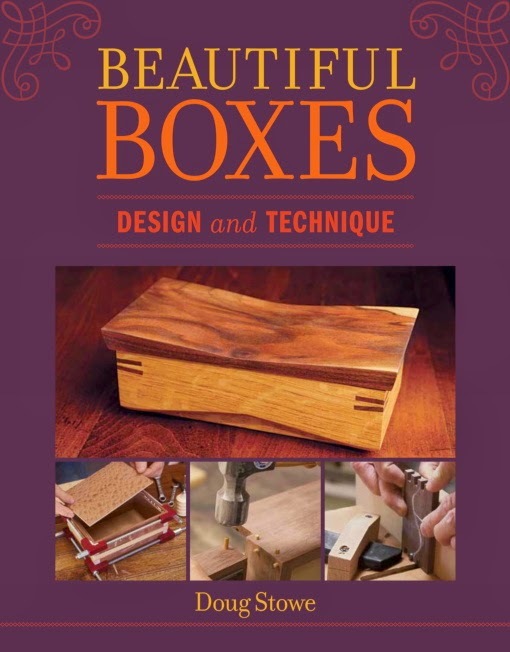 I received copies of my new book, Beautiful Boxes, Design and Technique yesterday from the publisher, Taunton Press. With each book (this is number 8, not counting two books translated into German) it has been amazing to hold so much work in my hands and to know that it is being shared in ways that I would never be able to share without help. A book is exactly that. I make boxes (and other things) in my shop, take photos of each step, and write the steps out so that others can read and understand. Then others take hold, help me to edit and clarify my explanations of work and create books from my starting point that allow my own work to shape skills in other hands than my own. It is an honor to work with such a good team in developing such fine books. And I pinch myself in wonder at how lucky I've been. Yesterday in the wood shop, my upper middle and high school students worked on their mechanical drawing. They now want to make their own T-squares. We can oblige, but I want them to know how to use them first. Today I will be with the Arkansas Arts Council in Little Rock as part of a panel to select the recipients of various Arkansas Governor's Awards in the Arts. In wood shop, I get to see transformational things happen that would be inappropriate to share in this blog. I see personal triumphs that shape the lives of our kids. Today I was witness to one of those. The crazy thing is that people think that woodworking is about making things. It is actually a process through which we ourselves are shaped and refined into new form. It is called craftsmanship, and the real product is the skilled craftsman. Let not one single day pass without engaging your hands in something skilled or creative. As adults we learn about standards. For instance if you are writing something, it needs to conform to the basic patterns of word use and punctuation in order to be read and understood by others. If you are writing something for publication and not in a blog, or an email to a friend, editors will be involved in bringing the text to certain standards. If communicating an idea on paper, as one would do as an architect or draftsman, the image must be clearly presented, and certain standards must be met. So it is a challenge in schools to bring a perfect balance between allowing creativity and exploration, and requiring the child to adhere to certain standards of layout and design. On Tuesday, my students from 5th through 10th grades began a project in wood shop in which they were to present a model in three views using t-square, drawing board, etc. I also wanted them to letter their project in the kinds of formal lettering that draftsmen once used. Sadly, if seems, I presented them too much information for them to absorb at one time, and their understanding of what I wanted got confused as some raced and got ahead of themselves. Some simply traced the model in three views rather than carefully measuring and drawing... thus avoiding the acquisition of skill. Others simply ignored the layout that I had described and demonstrated. This afternoon, I get to start over and ask the kids to do likewise. We will regard Tuesday's work as first draft. When they ask, "Is this OK?" I plan to redirect them to what the project was intended to look like in the first place... and redirect them to what I want them to learn from it. When kids leave school and enter the real world, the idiosyncrasies of their work will not be valued. So asking them to adhere to standards in school expressions of what they have learned is a good thing. The photo above is from Tuesday when I introduced my first grade students to the wood shop. 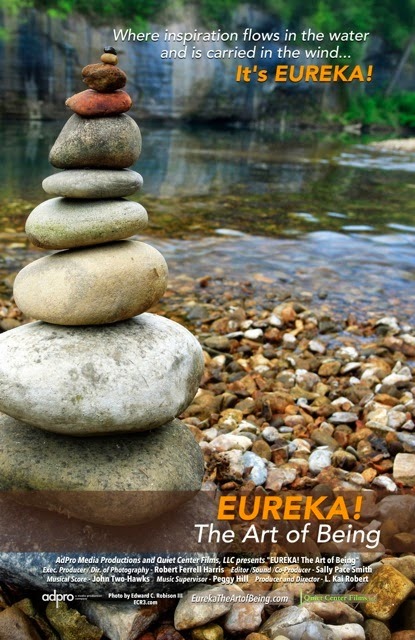 Last night my wife and I watched a screening copy of Eureka, The Art of Being, a documentary film produced by L. Kai Robert based on the arts community of Eureka Springs. We have hopes that it will be widely shown, as it tells what the arts can bring to community, and more, what artists can bring to each other when we live in community of shared values that involve creativity and the arts. We loved the movie as it was populated by friends, and lovingly portrayed our small town. Sadly, not all of our friends could be in it. But anyone who has spent time as an artist knows that we are not each honored in the same way or at the same time. I was given the last words, telling how the fabric of community is woven strand by strand, giving both strength and warmth. L. Kai and I were talking about the film this morning. There is a growing arts community on the west coast, ambitious to follow in Eureka Spring's foot steps. If you want to start an arts community from scratch, it's best to start about 50 years ago and build from there. A friend alerted me to the World Made by Hand series, written by social critic, James Howard Kunstler. In this fictional series, Kunstler writes about a world stricken by the collapse of the oil based high technology economy and culture of today. In the World Made by hand series he reminds readers of the richness of the hand made culture that we would have if our speedy transportation, mass media, and digital distractions were removed. My own town of Eureka Springs is not the Geography of Nowhere, but if corporate America, were to have its way, with AEP building extra high voltage power lines through the middle of our beautiful lands, as they propose, we would inch our way toward the irreversible ugliness they have allowed to inhabit so much of the US. We formed Save the Ozarks to stop them and while I can't claim we're winning yet, we have fought hard and have landed a few good whacks against the corporate behemoth and their regulatory minions. It is odd that we celebrate labor by taking a day off from it... whereas those who do not labor might better celebrate labor by doing some more of it for a change. Those who live in the purely academic realm or are concerned only with the theoretical and political ought to know that where the hands are engaged greater intelligence and character arise in the individual, and greater health arises in human culture. No nation can be strong in which the hands and head are divided against each other or the hands left idle. We know now that the brain is influenced by the bacterial culture present in the gut, and that having gut feelings are more than just an emotional response. We are bodies, and to think that the head can be filled with facts, without allowing the body to move and ascertain the truth of what we are being taught, is the worst possible way to teach, and the poorest of all possible ways to learn. The mind seeks the truth and the hands find it. I have a long list of labors for today. I will prepare stock for tomorrow's classes at the Clear Spring School, meet with a web designer working on a new website for Save the Ozarks, and work on the finish of replacement windows that we had installed at various times over the past two years. Because it is also raining after a month long drought, I will use the tractor to repair our long gravel drive. In the meantime, I'll suggest that labor must be celebrated. The costs of escaping it are the losses of human intelligence, the character of the individual and the wealth of human culture. We revel in our labor saving devices and shovel down the medications necessitated by our disengagement from the real world and its labors, and from the very real internal rewards of such. Instead, let's grasp joy by putting our hands to work.